Itinerant Office has released eleven series of three-part interviews which gather the opinions from influential figures who, despite each having unique experiences to share, are united through an internationally recognized career path. These series are composed of three short interviews, the first being a biographical inquiry into their PAST, followed by an analysis of the conditions that characterize the approach of their PRESENT day practice, and finally, a speculation into the FUTURE of architecture in the next 15 to 20 years. ‘Past, Present Future: about being an architect yesterday, today and beyond’ – is a project curated by Gianpiero Venturini – Founder of Itinerant Office and filmed by Luca Chiaudano. 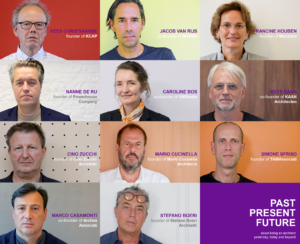 We met some of the most established Dutch and Italian firms worldwide, speaking with the likes of: Kees Christiaanse – Founder of KCAP; Jacob van Rijs – Co-Founder of MVRDV; Francine Houben – Founder of Mecanoo; Nanne De Ru – Founder of Powerhouse Company; Caroline Bos – Co-Founder of UNStudio; Kees Kaan – Co-Founder of KAAN Architecten; Cino Zucchi – Founder of Cino Zucchi Architetti; Mario Cucinella – Founder of Cucinella Architects; Simone Sfriso – Co-Founder of TAMAssociati; Marco Casamonti – Co-Founder of Archea Associati; and Stefano Boeri – Founder of Stefano Boeri Architetti. ‘Past, Present, Future’: portraits of the architects. Photographs by Lucia Chiaudano©. Click to watch the interviews. We discover intimate details about the journeys to becoming established architects, revealing funny anecdotes about their student days, key moments of inspiration, and the familiar struggles of a business with no experience. In these reflections, Kees Christiaanse studied with Rem Koolhaas as his professor and looks back on the time he had spent with Jane Jacobs, and Francis Houben recalls her friendship and admiration for Charles and Ray Eames. Simone Sfriso speaks of the importance of making mistakes as a young designer, and how, if it wasn’t for them, he wouldn’t be where he is now. And not everyone started out as architects. Caroline Bos tells us how she was studying the history of art, and how her architectural knowledge “only started when we had become an architectural practice”. Whilst Cino Zucchi decided to go to architecture school for the love of a girl, Jacob Van Rijs confesses to us how he ‘studied architecture by chance’ after not being selected for an industrial design course, and tells us a funny story about the first days in his career where a client he tricked a client into thinking that their office was a lot larger than it actually was. In the early days, KAAN Architecten started out in a rented garage. Stefano Boeri talks about the success of their current vertical forest social housing project in Eindhoven, as well as admitting to embrace both successes and failures as an architect: “I understood that it was very important to elaborate failures, and to make that elaboration public”. Francis Houben compares Mecanoo to a ‘symphony orchestra’, informing us that through hiring a diverse workforce with different skill set can provide a lot of ‘inspiration’ and ‘knowledge’ for a project. Whilst Marco Casamonti talks of the present in more abstract terms: ‘in my opinion the present does not exist, the present moves’, while Mario Cucinella expresses his concerns for Starchitecture overshadowing the true role of the architect, which he believes should focus on social impact, and improve the quality of life for people who live in poor conditions in the city. Each architect forecasts their predictions for the future of both the profession and the urban environment, with recurring themes, such as smart cities, sustainable approaches and digital infrastructure. Caroline Bos talks the about need for architecture to be adaptive, and discusses the possibility of sensor-based architecture being prominent in the future: ‘we could envisage a future where architecture is mostly software’. Nanne De Ru talks about about the ‘incredible speed’ that urban living is picking up, and ways we can avoid the ‘London syndrome‘ in order to keep buildings and facilities accessible to all. Kees Kaan talks about the ‘redefinition of functionality‘ in regards to the ever-changing urban environment, mentioning his interest in digital infrastructure, which he believes has the potential to help us establish cityscapes with “higher densities without losing quality”. Cino Zucchi echoes this notion, mentioning idea of the city being a body which is “much greater than its inhabitants”, and when talking about our disposable lifestyles, reminds us “we cannot throw away the city”. Mario Cucinella stresses the inevitable arrival of the future, saying that sustainability is the only way forward. He reminds young architects not to get carried away with their ego: “don’t forget, architecture is for the others”. Click on the image above to watch these interview episodes in our video section, or visit our vimeo channel to find out more.